Each year, ENERGY STAR® New Homes presents Market Leader Awards to outstanding partners who have made important contributions to energy–efficient construction and environmental protection by building or verifying an outstanding number of ENERGY STAR® Certified Homes during the previous year. 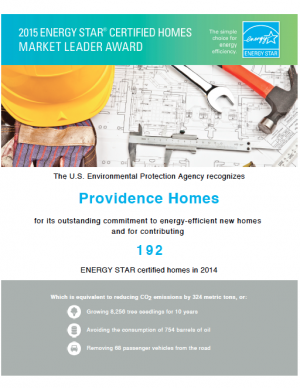 This is the 6th year in a row that Providence Homes has received the ENERGY STAR® Certified Market Leader Award (formerly known as the Leadership in Housing Award). “We’re proud to be a 100% ENERGY STAR® Certified Home Builder,” said Sean Junker, president of Providence Homes. “We are committed to offering state-of-the-art homes with a comprehensive package of features that deliver greater value, quality, comfort and unmatched performance.” ENERGY STAR® Certified homes offer homebuyers all the features they want in a new home, plus energy-saving features like effective insulation systems, high performance windows, tight construction and ducts, properly-sized and installed efficient heating and cooling equipment, efficient products, and third-party verification of energy performance.